Unit 1, Avondale Business Centre Avondale Road, Fleet, Hampshire GU51 3FL United Kingdom. The UK’s most reliable same day courier service provider. 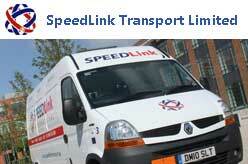 SpeedLink provides urgent, TIME CRITICAL COURIER services across the UK, EU and Canada. Shipments can be tracked in real-time via GPS with instant email POD’s. Freight Services – Air Freight, Road Freight, Sea Freight, Pallet Distribution, Removals.